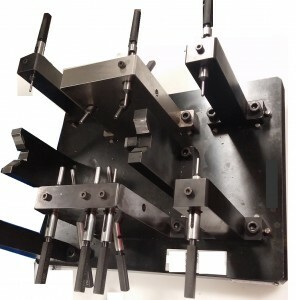 Yanaka is a manufacture of customized gauges that can be used both quality control lab and mass production line side. Yanaka offers gauges that can measure the hard-to-measure areas. For example, this gauge in this picture is called drilled hole location check gauge. When machined object has multiple drilled holes, but all hole locations need to be checked at once, this gauge can do so. This custom gauge checks the run-out of drilled hole by inserting am arm stylus into the drilled hole and by turning the part on the gauge. Dial gauge will read the run-out of the drilled hole. Yanaka also makes gauges that are hand held and for quick checking of parts tolerances. 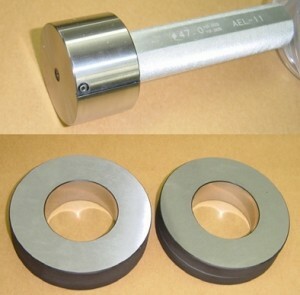 Examples of the small gauges are shown here. Go,Not-Go ring gauges to check size of the machined objects.